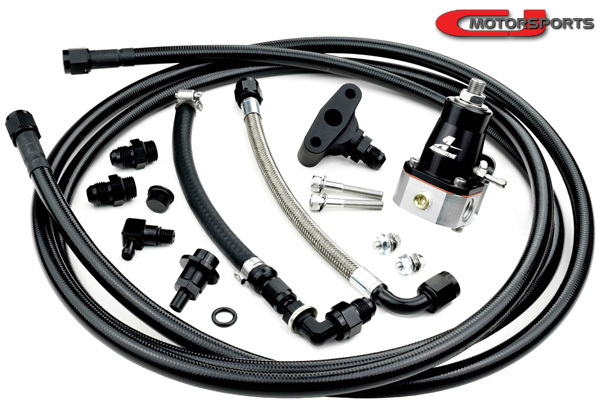 The CJM S0 system includes all the essentials for converting your DE 350z or G35 fuel system to a return style configuration along with an adjustable pressure regulator. A return fuel system with manifold pressure reference is critical for maximizing the effectiveness of your fuel pump and injectors while also contributing to a safer and more reliable tune. This fuel system retains your factory pulsation dampers, smoothing out your fuel tables and tremendously reducing part throttle stuttering. The factory 5/16" feed plumbing is untouched and the factory rails are left in place. The S0 system sources return fuel using our CJM 6AN Fuel Tap between the rear pulsation damper and driver side rail. A -6AN hose leads fuel to the inlet of the adjustable regulator. Another -6AN hose returns back to the fuel pump housing. Each external hose in the system is constructed of PTFE with a stainless braid and crimped hose end fittings. The return line to the fuel tank has a black PVC coating to protect your vehicle and wiring harness from any raw SS braid abrasion. This system utilizes a "return correction", which is a vital modification kit for the fuel pump assembly that properly converts it to return-style while still retaining the factory in-tank venturi system. Without this modification the fuel pump would be unable to recover fuel from the left-hand side of the tank. G35s require a longer return hose than 350z. Sedans require a different return correction kit. 3 feet is sufficient to protect the return line from from the regulator until it leaves the engine bay. 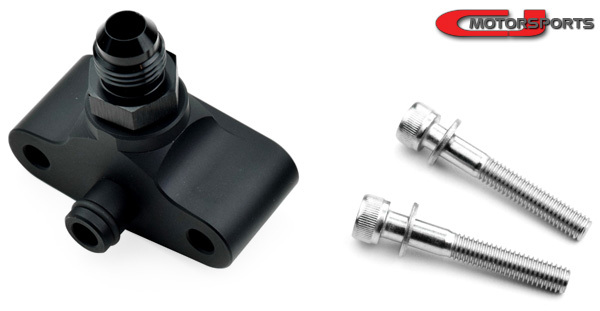 CJM Fuel Tap, 6AN: Billet Aluminum with 6AN adapter fitting. Viton O-Rings. SS Screws & Washers. 6AN PTFE Hose, Exposed SS Braid, Fuel Tap to Regulator. 6AN PTFE Hose, Black Coated SS Braid, Regulator to Fuel Tank.